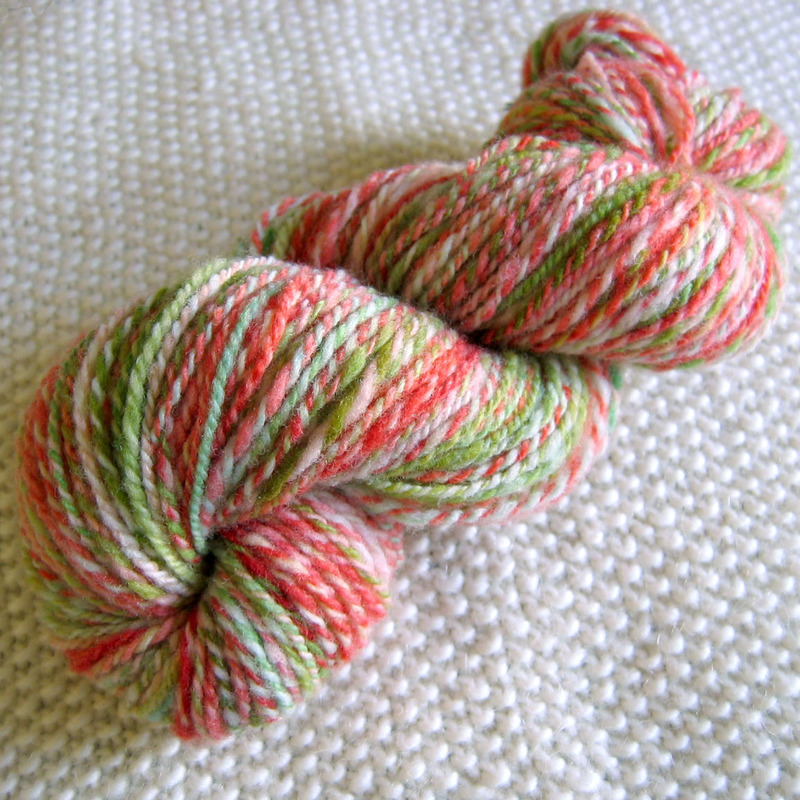 Before I show you the mucky job of cleaning fleece, here are some prettier pictures of another finished skein. 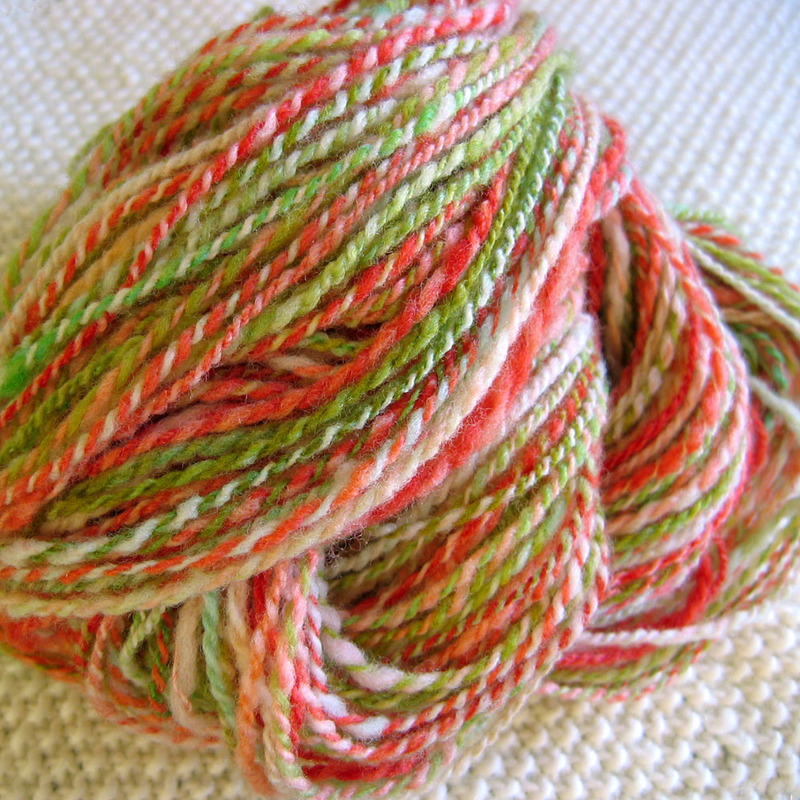 This one started out with the "apple tree" roving. If you're learning to spin and finding the drafting difficult the best tip is to pre-draft your roving. Gently pull at the roving until it's thinned out as evenly as you can. When roving is drafted out very thin it's called "pencil roving". After drafting I wind the roving back up into a big soft ball and it's lovely to work from when it's prepared this way. The picture above shows how the single looked. The colours are mainly distinct, with a small amount of candy caning here and there. 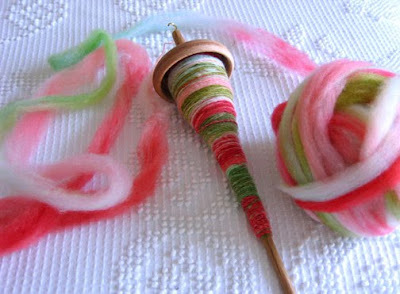 This is when you have two different colours of roving that you spin together. I like the way this looks so I purposely let it happen. After spinning the singles I plied on the drop spindle using an Andean bracelet. At this stage the spindle can get really full. 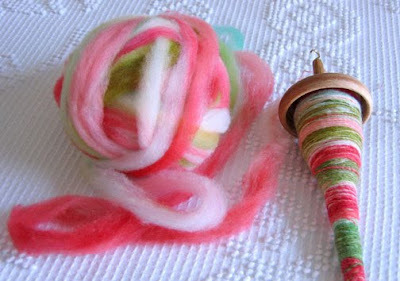 The spindle will still work but the yarn can sometimes slip down a bit. I wind a bit of painter's tape at the bottom of the shaft to keep the yarn secure. After plying all the colours blended with mixes of red, white and green and I realized that it was starting to look a bit like Christmas candy. This is the finished skein. This yarn is also in my shop, mainly because while I love the yarn, right now I'm all about the spinning. Hello! 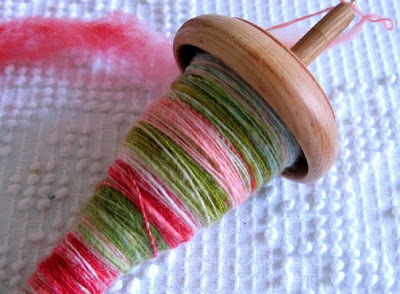 I am a new reader to your blog and I have been enjoying your spinning. I have been teaching myself how to spin the last couple of months and I am finding your blog to be inspirational. I cant wait to see how you process that wool you bought. I'm also very much about spinning right now. Have you tried plying balls? It's winding a multi-stranded ball and plying from it instead of the bracelet. It's what works best for me, especially for finer singles. This looks very pretty, I can't wait to give mum her spindle.